Start your evening off in style, join us on The Patriot for an Island Music Cocktail Cruise. The Patriot will be boarding at her home dock next to the Crab Claw Restaurant at 5:15pm and will be departing at 5:30pm. We will be cruising on the Miles River, The Wye River or Leeds Creek based on weather and the wishes of the passengers on board. Included in the fee is your first drink that will help you relax and enjoy the sights of the beautiful 200 year old mansions and amazing wildlife. This cruise will take you by at least one of the homes used in the filming of the movie "The Wedding Crashers". 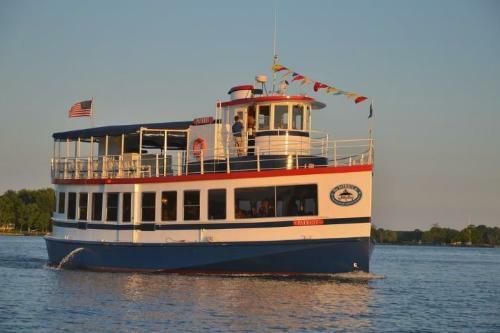 We plan on returning to our dock at 7pm but sometimes we are having such a great time we are a few minutes late getting back so don't schedule dinner until 7:30pm. Reservations are requested by emailing your interest to info@patriotcruises.com. We look forward to creating a memorable experience onboard The Patriot. The Patriot - is home docked outside of the Chesapeake Bay Maritime Museum next to the World Famous Crab Claw Restaurant. You can park in the Chesapeake Bay Maritime Museum parking lot for free if you are riding on The Patriot. The Price is $29.50 and includes all taxes and most importantly, your first drink is free (Beer, Wine or Rail Mixed Drinks).